The new direct solder type PCI Express x1 x16 and PCI flexible riser from HDPLEX support both right angle and left angle. When using left angle, the expansion card component side is facing down towards the motherboard/case bottom plate. If use right angle, the component side will face up to the PC case top plate. PCIE x1 Flexible riser card retail for 9USD. PCI and PCIE x16 retail for 15USD. 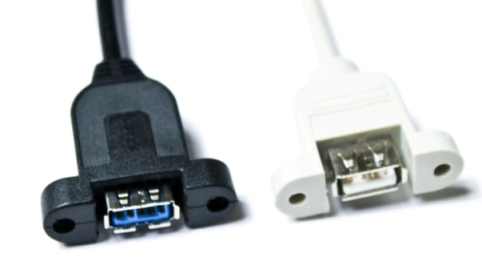 USB 3.0 and USB 2.0 internal cable share the same spec except for the port plug on the motherboard. The cable is interchangeable. HDPLEX H5.S fanless HTPC case come with USB 2.0 cable by default, you could choose USB 3.0 option for 3USD extra. We are also selling it seperately for 8USD on www.hd-plex.com now. According to this post from avsforum, HDPLEX internal IR receiver is confirmed to work with Logitech Harmony One Remote. You could locate the code by using Microsoft as the manufacturer and MCE-1039 as the model.